With last night’s win, the Golden Knights now have 86 points. They lead the Pacific Division by 12 points and still maintain a three point advantage on the Nashville Predators for the lead in the Western Conference. We’re all thinking playoffs, so we figured it was time to add a new sidebar to the site to help show exactly how close the Golden Knights are to clinching a spot in the playoffs and to win the Western Conference in the regular season. The idea is to find out exactly how many points the Golden Knights need to have to eliminate each individual team. 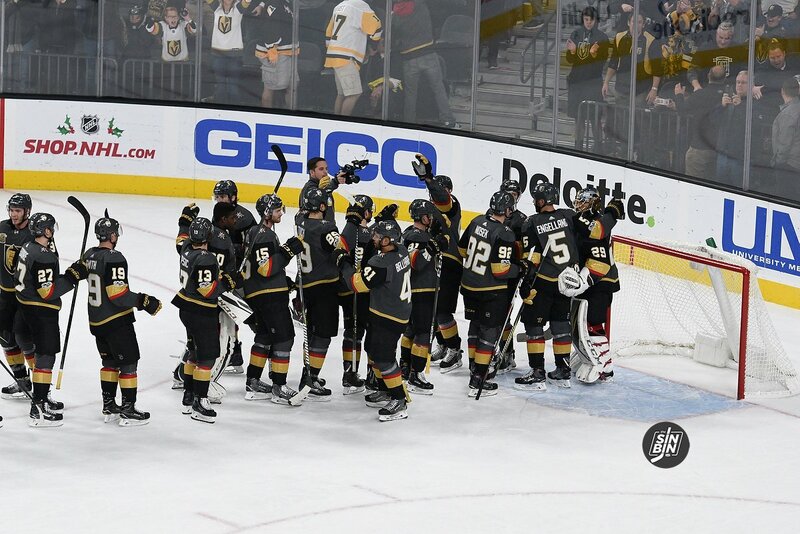 Once they are all eliminated, the Golden Knights will have clinched. So here they are (and they’ll be stuck on the sidebar of SinBin.vegas for the remainder of the regular season). So what does the “points to elimination” number mean? The goal is to get that number to 0. There are two ways to take points off the number. First, the Golden Knights earn points. If they win, you subtract two from the number. If they lose in OT, you subtract one. The other way is for the team in question to fail to earn points. If they lose, you subtract two. If they lose in OT, one. If the Golden Knights lose and the team in question wins, then the number remains the same. This is awesome. I’ve somehow never heard of ‘points to elimination’ before. What an elegant way of counting down to the playoffs. Nice work as always! That’s cause I just made it up! Holy crap, this is brilliant. You should call it the ‘Bohlke’ number or something so you can keep the credit. The Corsi guy gets a number, you should too. Trademark this idea then charge espn millions to use it! BWAHAHA!!!! Wow, I have followed hockey for a long time, and this an awesome help. I know the people at the NHL office let you know when clinched, but to be able to follow and figure out myself in an easy format is amazing. Great job guys. I love it. Right now, the LA Kings are the team to watch. Assuming the VGK win a divisional playoff spot and don’t fall to a wildcard, the Kings are the first team out of the playoffs in the Pacific. As the article states, our magic number with the Kings is 28 points. Any combination of 28 points gained by us or lost by the Kings gives us a playoff berth. That’s why our upcoming home and home is so important, it’s worth eight points. If VGK win both games, that magic number decreases by eight. Almost everything VGK does, on or off the ice, turns out golden, especially tracking towards making the playoffs in the first year of existence. Winning the Presidents Trophy would be a third USA “miracle on ice”, let alone winning some rounds in the playoffs. Did I say third? The USA Men’s curling team beat the reining gold medalists from Canada TWICE and upset the reining world champions Sweden in the final by scoring 5 points in the 8th end, when the score was tied, to win the first ever USA gold medal in curling. Their performance was unbelievable and deserves worthy consideration for the second miracle on ice status. Also, the USA Women’s hockey performance was “golden”, as well, after a 20 year drought. Perhaps their Captain Knight should get some selection consideration to carry the USA flag, during the closing ceremonies (or the USA curling skip). Come Monday, I am back to focus on cheering on the VGK’s quest to win the silver cup, which definitely would be another “miracle on ice” story! Check that, Duggan is the captain, not Knight. Instead, maybe Hilary Knight could be asked to drop the puck for the opening ceremonial face off, prior to the first ever VGK home playoff game to honour recognition for her teams’ Olympic accomplishment. Her last name is fitting. Could be my new favorite column of the year! NOW – I’ll be adding your site to my daily surf routine! This is awesome! Thanks!